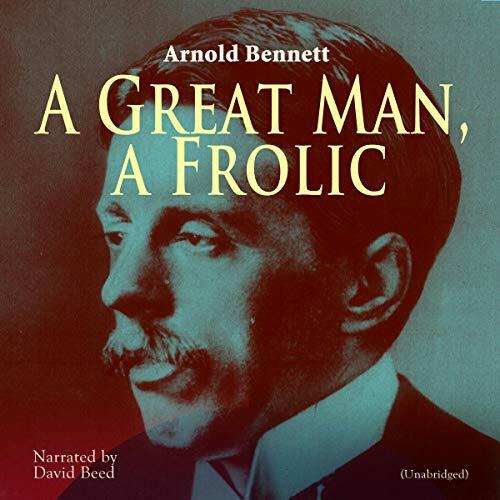 "A Great Man: a Frolic" (1904) is a humorous novel by Arnold Bennett about the beginning of the marriage of another author: Henry Shakspere Knight. "On an evening in 1866 Mr. Henry Knight, a draper's manager, aged forty, dark, clean-shaven, short, but not stout, sat in his sitting-room on the second-floor over the shop which he managed in Oxford Street, London. He was proud of that sitting-room, which represented the achievement of an ideal. The rich green wall-paper covered with peonies in full bloom matched the magenta table-cloth of the table at which Mr. Knight was writing. The fine elaborate effect thus produced was in no way impaired, but rather enhanced and invigorated, by the mahogany bookcase, the horsehair sofa netted in a system of antimacassars, the waxen flowers on the marble mantelpiece, the rosewood harmonium, and the posse of chintz-protected chairs. Mr. Knight, who was a sincere and upright man, saw beauty in this apartment."